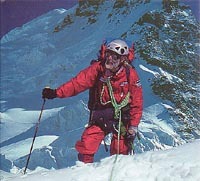 Chris Bonington on Sepu Kangri Poster: Bonington, Chris. Chris Bonington, Charlie Clarke, Jim Curran and team made several attempts over several years to reach the summit of 6860-metre Sepu Kangri and did reach the West Summit, just 200 meters shy of the Main Summit. This great image is identical to the cover of the expedition book ‘Tibet’s Secret Mountain: The Triumph of Sepu Kangri’. Bonington is well known for his many expeditions to Everest, K2, and throughout the Himalaya. This poster is imported.